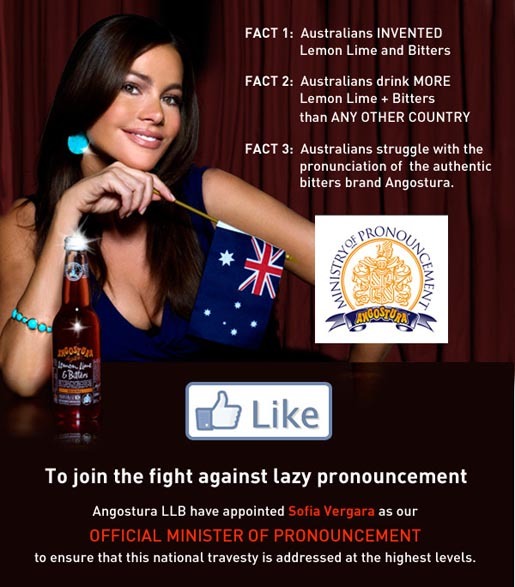 Frucor Beverages has recruited Colombian actress Sofia Vergara, star of ABC’s TV show Modern Family, to front a new advertising campaign teaching Australians how to correctly pronounce the word “Angostura”, the Lemon Lime and Bitters drink. Ms Vergara will be educating the Australian public through a series of video messages delivered via the ‘Ministry’s’ official Facebook page www.facebook.com/AngosturaLLB. She will also campaign on radio, in magazines and newspapers starting right at the top by urging Prime Minister Julia Gillard and Opposition Leader Tony Abbott to lead the pronouncement challenge “by example”. The Pronouncement campaign was developed at Bulldozer Inc, Sydney, by executive creative director Andy McKeon, creatives Simon Blazey, Ben Nott, and Ken Buchan, and producer Justine Cooper, working with Cathrine Dyer and Nathan Forde at Frucor Beverages. Filming was shot by director Gabriel Beristain via Triumphant Pictures, Los Angeles, with executive producer Cecil Chambers. PR was handled by Rob Lowe at Eleven PR. Media was managed at OMD. Social media was produced at Klick Communications. Celebrity talent was managed by Lisa Purcell at CMA.